I have really been neglecting my exercise throughout this entire diet that I’ve been on using the Noom app on my Android phone. I have no excuse, but I really do lol. With my degenerative disc disease in my spine, it’s difficult to walk long distances and I don’t have a bicycle anymore since my last accident which caused me to break my arm. So the only thing I can really do is walk, which again is hard on my back. 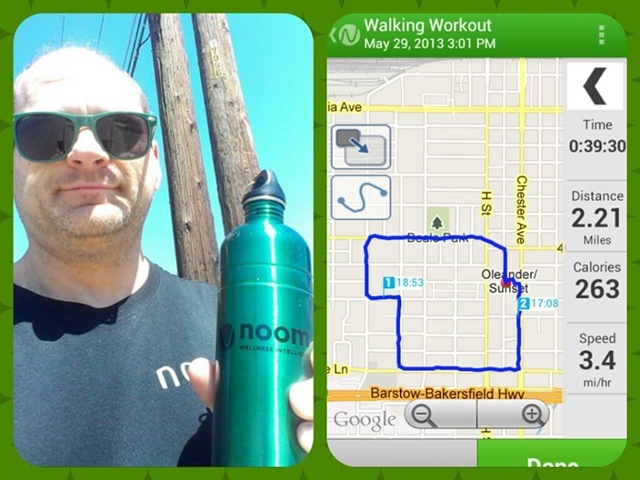 Yesterday I took a vicodin and went out and just walked as far as I could with my Noom swag on. I was in pain from the minute I left the house until I came home, except the pain was excruciating by the time I came home. But, what other options do I have? As you can see from the picture above, I walked 2.21 miles at an average speed of 3.4 miles per hour for 39 minutes and 30 seconds and I burned a total of 263 calories. It’s not much, but it’s the best I could do. I hope to get a new bicycle some day, but money is always tight so it’s really difficult to save anything. I am selling the keychains on Etsy and whatever I get from that will be saved so I can buy a bike. Of course, I probably won’t sell very many. I’ve only sold 1 and the profit from that was like $1.87 or something. So yeah, I don’t expect that to help me buy a new bike. Until I can buy a new bicycle, all I can do is walk. It’s free, although I don’t know how free because it does come with a huge cost, and that’s back pain. I plan on going out again today because I know I should get SOME exercise lol.